Want to say what's right, and whats wrong? Want to have the power to punish and forgive? Want to be the Judge of Deeds? Take on the role of a priest for the Church of Spades, in a remote parish, and help your people grow under the guidance of the Great Church of Spades. 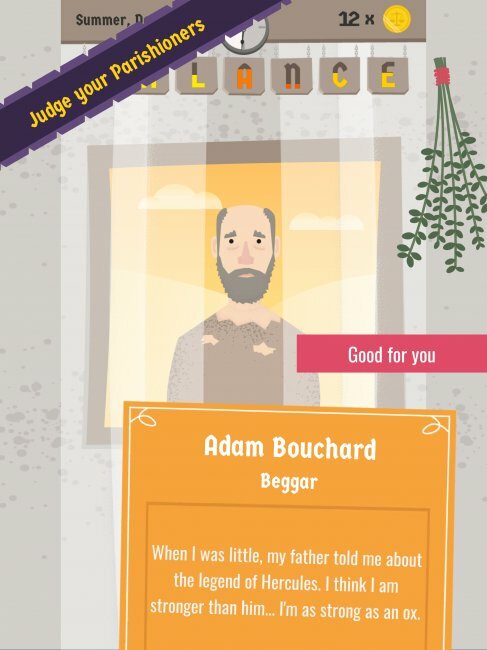 Forgive Me Father is a decision-making game in which the player has to balance the impulses of people. Some people steal, white others give, some people boast, while others are shy and introvert. It is you who will deliver Justice, however you see fit. And since great power also brings great responsibility, it is you who will support the consequences of the Judgement you bring. Developed in a basement, with care. Cool game! I really liked the idea but I want to see more of it! When did you get bored? First, the game is based on Reigns, which I love (both of them) which is a +1 already. I'm also very familiar with the swiping mechanic and the balance you need to keep on the different categories. The visuals are excellent. Looks great to me, didn't feel like a beta and let me get into the game. The basic idea of a priest with a confession both is brilliant and fit the game mechanic perfectly. Well done. The stories of the people are simple and understandable. There are too many things to balance (7 sins) and they are not that distinct from each other. It's not that easy to understand quickly what you are going to influence. The Cardinal is speaking too much. Feels forced a bit. The additional data (Family, Perish etc) is redundant. It's not an interesting challenge to handle and just feel stuck in the middle of the action. The sleep is also disruptive. If you lose the Family/Perish etc just assume I sleep and let me continue with the game. I'm still looking for interesting narratives that unfold. that was the most interesting bit in Reigns, the narrative that unfolded with some of the characters over a few deaths. All in all a very good game, well done! Hope to see it out publically soon! Hey, thank you for taking the time to write this roast. I've iconified the 7 deadly sins... I also felt they are hard to follow. Also used another friendlier dude to do the tutorial (instead of the Ace). They'll be available live soon! I really love this game, it's fun, and original, and interesting. But I unlocked all buildings and 29/30 people, I keep playing but nothing is happening, no new characters. I also had to restart this game once because of that: at some point you're just playing and nothing happens, even though you didn't unlock everything yet. Also, the woman that offers to see how my decision affects balance stops showing up at some point, even though I need it. So yeah, keep it up, I hope you'll fix those and I truly hope you'll grow a big audience because this game deserves all the fame in the world. Thank you! Hey Jane, thank you for the time to play and write this roast. I'm aware of the problems you encountered and they've been fixed. I'm gonna push an update on test flight in the next week that will fix the Insights Woman disappearing and the Town Crier not getting unlocked :). If you like it, like/follow/share us on social media. I'm attempting so self-publish this game, so all the help I can get is well received.